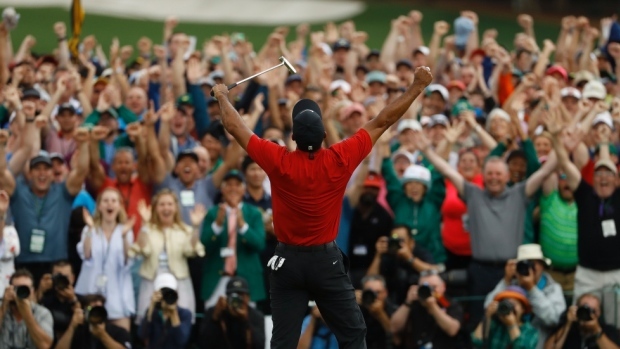 With a throwback performance at Augusta National, Tiger Woods has won the 2019 Masters Tournament, completing a comeback 14 years in the making; his last major win was the 2008 US Open, and he hasn’t won at the Masters since 2005. After years of injuries and a lengthy path to recovery, Tiger is finally back in the winners’ circle. While improbable in the long term, given the laundry list of injuries that he has had to return from, Woods has been trending in a good direction in recent events and as a result, many sportsbooks regarded Woods as a top contender entering the Masters with 14-1 odds, fourth best in the tournament. Still, somebody bet big on Tiger, and now they’re winning big. According to Darren Rovell, a bettor placed an $85,000 wager on Woods with the William Hill sportsbook and will reel in a profit of over a million dollars as a result. It’s the biggest payout for an individual golf wager in William Hill’s history. They were hardly the only sportsbook to take the L on Tiger’s big win. Of course, Tiger’s win is a special moment for just about any sports fan, but even more so with this guy. If you have $85,000 worth of play money to put on a Tiger win, we’re guessing that you were doing just fine to begin with, but way to ride with the Big Cat anyway! Everybody wants to get on board with Tiger. As a result, the Golf Town store reported enough traffic to nearly cause its website to crash, all because of the interest level in purchasing the red mock-neck sweater that Tiger wore with his win.